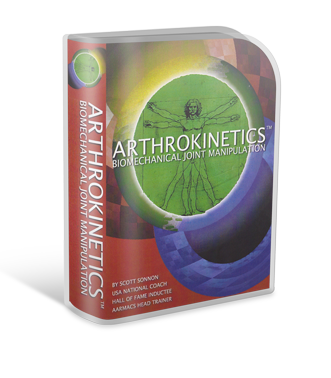 Arthrokinetics is the study of how the bodily joints function and dysfunction during a fight. Drawing upon Scott Sonnon's experience as a Sambo and Catch-Wrestling background, he carefully breaks down how to "create submissions" in grappling styles and mixed martial arts competitions. Demonstrating volumes of examples, this vintage encyclopedia teaches the science of submission fighting with Scottt Sonnon's signature attention to meticulous detail. You don't need to learn in this fashion, and could study Judo, Jiujitsu, Catch or Sambo over years and intuitively refine these nuances, but if you use an understanding of Arthrokinetics, you will accelerate your development and shorten the time required to become an innovator of your own personalized strategy of submission fighting.